It's half-time for Juncker's Team and after taking a closer look at how it has implemented the instruction to “ensure an appropriate balance and representativeness" in their lobby meetings, ALTER-EU has awarded the Commission a yellow card. 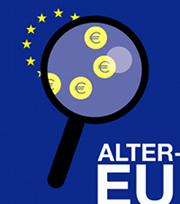 Since we started building our network in 2005, ALTER-EU has been criticising the privileged access that big business interests enjoy to the Commission – and its resulting impact on decision-making. We were pleasantly surprised, and had high expectations, when Juncker instructed his Commissioners to“seek to ensure an appropriate balance and representativeness in the stakeholders they meet”. This measure appeared to flag an acknowledgement of the problem of corporate bias, and the risk of corporate capture in the Commission, and a recognition that things needed to change. For ALTER-EU, corporate capture occurs where an issue, process, or dossier is influenced in the extreme by corporate interests. Corporate bias in terms of which lobbyists are granted meetings with Commissioners contributes to corporate capture. 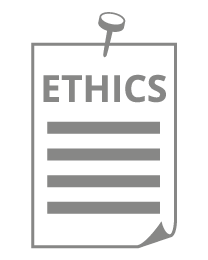 Other contributory factors can include the provision of corporate-dominated ‘advice’ or ‘expertise’; conflicts of interest and revolving doors hiring; the setting up of front groups; proactive outreach to big business by decision-makers; and many other tactics. In order to measure the success of Juncker’s instruction to his Commissioners, ALTER-EU did two things. As a first step, in order to see how individual commissioners have implemented this policy, we sent access to document requests to the Commission asking for all relevant documents. You can read the result of these requests under “No rule book” below. Secondly, in order to measure the success of Juncker’s instruction to his Commissioners, ALTER-EU calculated and compared the percentage of lobby encounters that individual Commissioners have had with corporate interest lobbyists, as well as with NGOs, trade unions, and other categories from the EU lobby transparency register, since December 2014. In drawing up this ranking, we have excluded Commissioners who have had less than 50 lobby meetings since December 2014, as it may not be possible to draw clear conclusions from smaller numbers. (See below for our detailed methodology; we used data from IntegrityWatch). There are 19 Commissioners who have had more than 50 lobby meetings in total. Of these 19, 12 or around two thirds have had 60 percent or more of their lobby meetings with business interests ie. 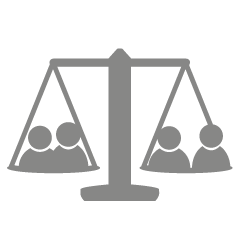 corporations, trade associations, law firms, lobby consultancies. 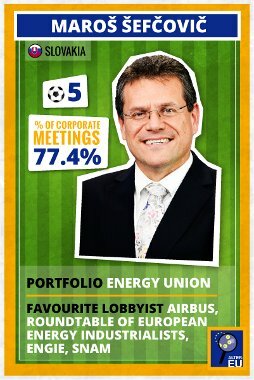 Throughout this week we have presented the eight with the highest percentages of encounters with corporate interests via our football cards. We think these Commissioners deserve a ‘yellow card’ for significantly breaching Juncker's instruction to seek balance in their meetings with stakeholders. 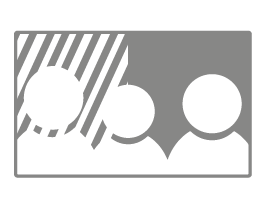 We also highlight two Commissioners who have met with a broader range of interest representatives, indicating that corporate bias in meetings does not have to be inevitable. Who earned a yellow card? The eight Commissioners with the highest proportion of lobby meetings with corporate interests mainly lead portfolios with strong EU competencies. Commissioner Elżbieta Bieńkowska with 86.9 per cent of lobby meetings with corporate interests is top of the ranking. Of course, as Commissioner for Internal Market and Industry she could be expected to have had some contact with business. But when Bieńkowska told the Commission’s EUIndustryDay event earlier this year that “every day should be EU industry day” she nailed her colours to the mast. 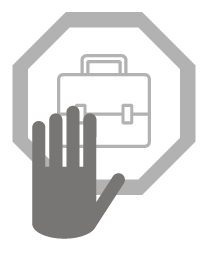 No Commissioner should listen so exclusively to the corporate sector, but it is also likely that the design of her portfolio with its demand to “improve the business environment and … access to markets and to finance” would inevitably lead to the post-holder being a champion of business interests. In this case, corporate bias seems hard-wired into the design of the Commission policy agenda. Bieńkowska's favourite lobbyists (lobbyists who had the most meetings with the respective Commissioner) are Volkswagen; the influential business association BusinessEurope; and Uber, the controversial taxi-sharing provider. Three of the five meetings held with Volkswagen were about ‘emissions fraud’, some at the request of Bieńkowska. She recently started two procedures against Germany, as a result of the Dieselgate scandal, for not taking action against Volkswagen and other implicated car manufacturers. 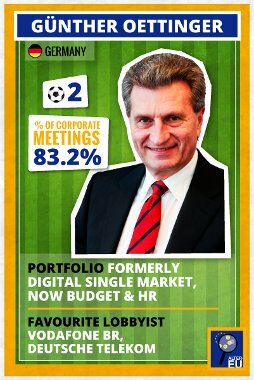 Commissioner Günther Oettinger is second in the rankings of Commissioners with the highest proportion of meetings with corporate interests. And with 529 lobby encounters altogether, he is also the Juncker squad member most available to lobbyists. Seen by absolute numbers, he has had around five times as many meetings with business as Bieńkowska. Oettinger's favourite lobbyists have been big telephone companies: Vodafone Belgium, Deutsche Telekom and Telefónica. This is not surprising as he was Commissioner for Digital Economy and Society until the end of 2016 and these companies have a big stake in e-privacy, data roaming, and other major Commission priorities. Overwhelmingly, with 83.2 per cent, Oettinger has met with business interests, despite the fact that his former portfolio set policy with hugely important ramifications for the public interest, including data privacy and online access to education and culture. Remarkably, despite leaving the digital economy agenda for his new role on EU Budget and Human Resources in January 2017, Oettinger has continued to hold lobby meetings on the digital economy, including with the trade association DigitalEurope. Every April, including this year, Oettinger has headed-up an exclusive business summit in the Austrian Alps, with high ranking business and political representatives. Also notable is the fact that, four months into his new Commission role, Oettinger has held three times as many lobby meetings as his predecessor Commissioner Georgieva did in the whole of her two years in the role. Oettinger’s personal penchant for meetings with lobbyists is troubling. One of Commissioner Jyrki Katainen's most frequently met lobbyists reflects a phenomenon which is often seen in the meetings of Commissioners. One of his ‘favourite’ lobbyists, the energy provider Fortum Oyi, is from Finland, as is the Commissioner. Business lobbyists often use their national Commissioner as a direct route to the Commission, whatever their portfolio, even though Commissioners are supposed to act independently of national interests. 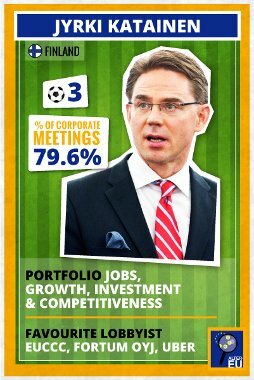 Katainen is Commissioner for Jobs, Growth, Investment and Competitiveness. He has had 197 lobby encounters and 79.6 per cent of these took place with business interest lobbyists, placing him number three in our rankings. 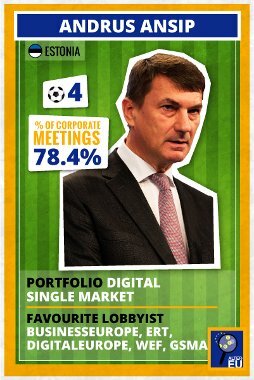 Commissioner Andrus Ansip is responsible for the Digital Single Market as well as (temporarily) for Oettinger's former portfolio, Digital Economy and Society. Like Oettinger, he has had a comparatively high total number of encounters (328), 78.4 per cent of which were with business interests, placing him fourth on the list. His favourite lobbyists have been extremely influential lobby groups such as BusinessEurope; the European Round Table of Industrialists, which consists of CEOs of large corporations; and last, but not least, the trade association DigitalEurope. One of the topics he was most lobbied on was data roaming, clearly a hard-fought lobby battle in recent times. Fifth in the rankings with 77.4 per cent of lobby meetings with business interests (168 encounters in total) is Commissioner Maroš Šefčovič, who is responsible for the energy union. He has the Airbus Group as one of his ‘favourite’ lobbyists, and the aviation package features as one of the hot lobby topics discussed. 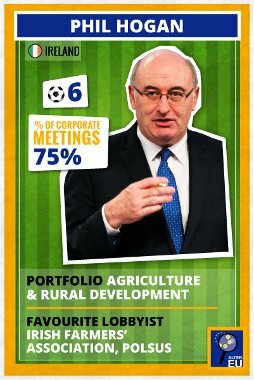 Phil Hogan, Commissioner for Agriculture and Rural Development, like Katainen has a lobby organisation from his home country among his ‘favourite’ lobbyists: the Irish Farmers' Association. Of his 104 encounters, 75 per cent were with business lobbyists, placing him sixth in our league table. Commissioner Violeta Bulc, responsible for transport policy, has had 209 lobby encounters, 69 per cent of which were with business interests placing her seventh. Her most frequently met lobbyists were the World Economic Forum which organises the annual summit in Davos for the world’s economic elites; the Association of European Airlines; and the Airbus Group, which is a top lobbyist with Šefčovič too. 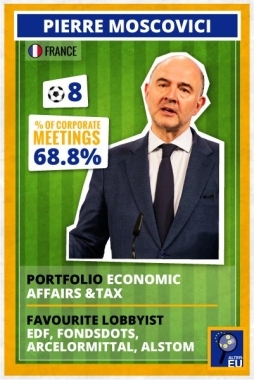 Pierre Moscovici, Commissioner for Economic and Financial Affairs, Taxation and Customs had 93 encounters, and 68.8 per cent of these were with business, meaning he earns the eighth position in our ranking. He also reported a 'favourite' lobbyist from his home country, the big French energy provider Electricité de France. Although he left the Commission in July 2016, Commissioner Jonathan Hill must also be mentioned. He had had 185 lobby encounters by the time he left office (a high number which is more than Commissioners Creţu, Hahn, Mogherini, Avramopoulos, Mimica, Vestager, and Stylianides have had combined over a longer time period!) with 87 per cent of these with business interests. This percentage is higher than any other Juncker Commissioner. Hill’s rhetoric and policy delivery emphasised deregulating the financial sector, and this fits a wider pattern. Earlier this year, ALTER-EU published analysis which showed that 92 per cent of the lobby encounters that took place January-July 2016 with Hill’s old directorate-general, namely Financial Stability and Capital Markets, were held with corporate interest representatives. Three well-known names show up several times in the lists of favourite lobbyists: Airbus Group for Šefčovič and Bulc; BusinessEurope, the influential umbrella organisation of European employers and big businessses, was one of the most frequent visitors to Ansip and Bieńkowska; and Uber, the ride-sharing provider, was a favourite of Oettinger and Katainen. In fact these corporate interests feature elsewhere in our full dataset and are among Brussels’ biggest and most influential lobbyists. According to LobbyFacts, BusinessEurope has had more high-level meetings with the Commission than anyone else (156 since December 2014); with Airbus fourth on the list of the Commission's most frequently met lobbyists (104 meetings). So much for Juncker’s instruction to seek “an appropriate balance and representativeness” when meetings stakeholders: it looks like it has been ignored. In February 2017, ALTER-EU asked all 25 directorates-general of the Commission for all documents setting out the measures put in place to implement Juncker’s instruction and for all communications between officials on this particular issue. In March we received an answer from the Commission telling us that no single document had been found. 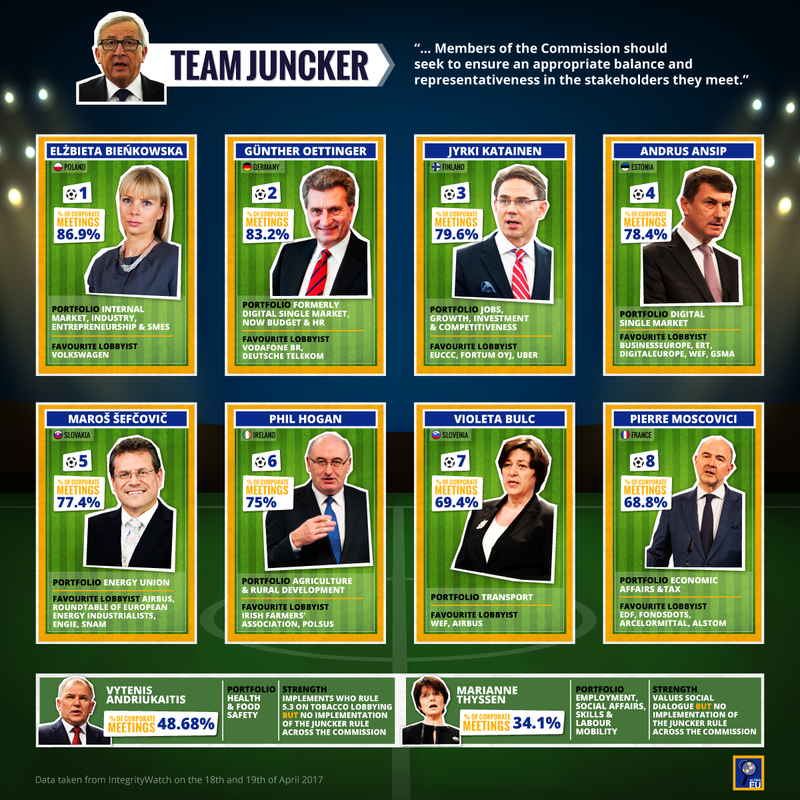 Juncker's instruction seems to have been a pre-match promise, not backed by any training, tactics, or tangible rule book. There is no sign that he has ever tried to implement or enforce it; nor have any of the directorates-general apparently taken this requirement seriously enough to discuss it. Although no Commissioner or directorate-general seems to have a rule in place to implement Juncker’s instruction about lobby meetings, some Commissioners have significantly lower proportions of meetings with corporate interests than our dataset shows. Among them is Commissioner Thyssen who is responsible for Employment, Social Affairs, Skills, and Labour Mobility, and has had 34 per cent of encounters with corporate lobbyists. Her encounters with trade unions are 29 per cent, which is higher than any other Commissioner; when combined with encounters with NGOs, the figure is 54 per cent. It is notable that almost all other Commissioners fail to reach even double-digit percentage figures for their encounters with trade unions. Commissioner Andriukaitis, responsible for Health and Food Safety, is unique in the Commission in properly implementing the World Health Organisation’s tobacco control convention which requires public authorities to keep contacts with the tobacco lobby to a minimum and to provide transparency on the meetings that do take place. The European Ombudsman has repeatedly criticised Juncker for not ensuring that the whole Commission adheres to the convention. Forty eight per cent of Andriukaitis' lobby encounters were with business interests. These examples show that it is possible for Commissioners to reduce the opportunities for capture of the decision-making process. A strategy for the second half of the Juncker Commission? The first half of the Juncker Commission has been a total disappointment to those who had hoped that the corporate bias which characterised previous Commissions might be addressed. As we have shown, too many Juncker Commissioners have earned a yellow card for their disproportionately high levels of meetings with corporate lobbyists and the absence of any discernible implementation of Juncker’s balance and representativeness instruction. Was Juncker's instruction just a gimmick? The Juncker Commission has much ground to make up in the second half. The publication of lists of Commissioners’ lobby meetings (also introduced by Juncker) was a welcome step, not least because it has allowed analyses like these to take place, and this proactive transparency should be extended to all Commission staff who meet with lobbyists. But while transparency can help to expose the problem of corporate bias, far more needs to be done to tackle it. For ALTER-EU, this issue is not about a simplistic 50-50 balance of meetings between corporate and public interests: capture of policy-making by private interests will not be solved if the Commission meets a few less businesses and a few more NGOs. 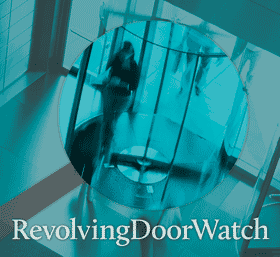 We would like to see a Commission which fully monitors and proactively publishes who it meets and which refuses to grant any access to lobbyists operating outside the EU transparency register; which is far more discerning in choosing the lobbyists it meets and is scrupulous in maintaining an arms-length relationship with them; which actively seeks input from, and listens to, citizens and communities; and which recognises that ‘advice’ from corporate bodies will always be motivated by corporate interests. But first and foremost this is about EU decision-makers remembering who they serve, namely citizens, communities and their (public) interests, rather than corporate interests. If that were to be the starting point of the policy-making process, we believe that a rather different picture of meetings with stakeholders - and policy outcomes - could emerge.